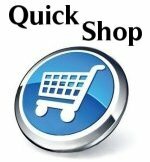 Shop Quick & Easy With Quick Shop!!! Welcome to our newest way to navigate at GutterSupply.com. You'll find everything you need for your particular job on a single page. The Material lists below are categorized by Metal. Click on your desired metal and then choose a Style, Size, and Color. The final page lists the items and pricing available for that system. Fill in the quantities for the items needed...and save as a quote or add them to cart with a single click!